There are some new choices to filter data by and, for users with multiple devices, we have improved the information in the pulldown that allows you to choose the device. You can filter the results based on a specific feed or IP address and can use the "*" wildcard when searching for an address. Examples are "192.168.*. *" and "192.*.100.*". Also we note the last time we processed a log in addition to the summary statistics of the report. When looking at the detailed reporting pages users will immediately notice that IP addresses are all underlined with a dotted line. Hovering a mouse over a particular IP address brings up a menu of drill down options. The top link on the drilldown list (Research) is a report on what we at ThreatSTOP know about the address, that is to say it is essentially the same as the what we used to report in a separate popup window. The astute will note that the new popup window has options to allow the user to add this ip address to either a custom block list or a custom white (allow) list. The next item down (Domains) is a popup that displays a report from the SIE passive DNS database about what DNS queries have resolved to that address. This is generally more useful for outbound analysis where the list can identify a phishing site or a known botnet C&C host domain name. Although the example above shows just three names, frequently these ip addresses will have been used by thousands of different domains (note that we do not display more than 10,000 domains). The remainder of the links open external windows to other (malware) research sites that we find useful in identifying information about a particular ip address. If anyone has other sites they find useful we will be glad to add them too. All these reporting changes are also added, where relevant, to other sections of the website such as the check logs feature. Finally - if you are still reading this far - here is a worked example of how to use the new features to confirm a bot C&C host and thus identify infected machines on your network. This is a real customer but the internal infected addresses have been obfuscated to preserve some anonymity. First run a report for recent outbound traffic filtering on the "BOTNET" feed and then click on "outbound connections" list. 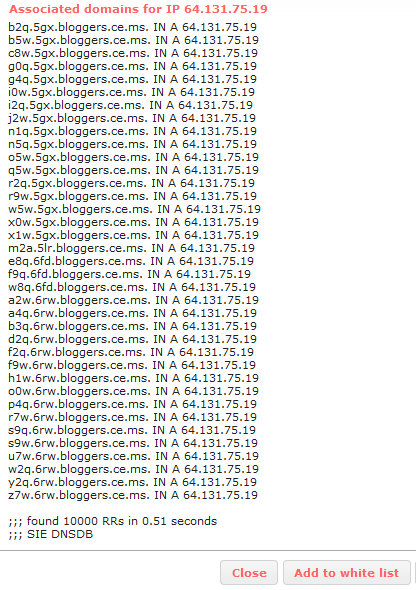 Next click on the "Research" tab for the Destination IP to learn that this address is a known C&C host: Then confirm by checking on the Domains link to see what sorts of names have been resolving to this address: 10k domains" src="http://threatstop.files.wordpress.com/2011/09/ts-report-10.png" alt="Botnet C&C with >10k domains" width="416" height="590" />Finally click on say the McAfee link to confirm that this is not just a figment of ThreatSTOP's imagination. Now that it has been confirmed that the IP address is bad the source IP addresses (192.168.x.51 and 192.168.x.52 in this case) should be noted down and the computers using them identified for immediate remediation.